This antibody recognizes a 66 kDa protein, which is identified as Tripartite motif-containing protein 29 (TRIM29). A431 cells. Tonsil or Squamous cell carcinoma. 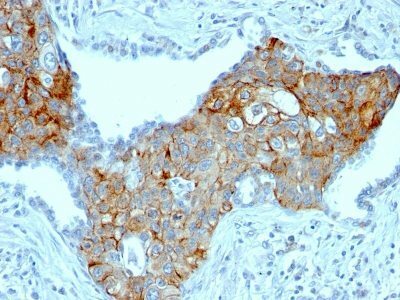 This antibody recognizes a 66 kDa protein, which is identified as Tripartite motif-containing protein 29 (TRIM29). It interacts with the intermediate filament protein vimentin, a substrate for the PKC family of protein kinases, and with hPKCI-1, an inhibitor of the PKCs. TRIM29 protein contains both zinc finger and leucine zipper motifs, suggesting that the it may form homodimers and possibly associate with DNA. High expression of TRIM29 has been reported in gastric cancer and pancreatic cancer, and correlates with enhanced tumor growth and lymph node metastasis. 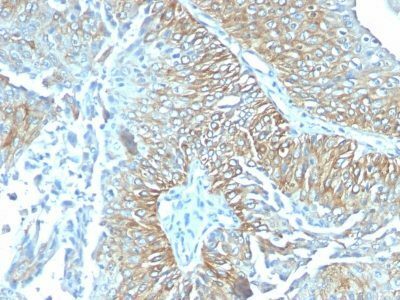 TRIM29 is also able to distinguish lung squamous cell carcinoma from lung adenocarcinoma with ~90% positive accuracy, when used in a panel with TTF-1, p63, CK5/6, and Napsin-A antibodies. Catalog number key for antibody number 1041, Anti-TRIM29 (TRIM29/1041) The prefix indicates conjugation, followed by the antibody number and size suffix.